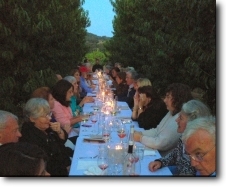 Our annual dinner at Dry Creek Peach is definitely a yearly highlight – this is our eighth year in the orchard! Words just can’t express the beauty of the peach orchard at the peak of season, the cold, sweet taste of White Peach Bellinis on a hot summer evening, the warmth and passion of farmers Gayle and Brian Sullivan as they lead a tour of their organic farm, and the engaging charm of chef John Ash as he orchestrates the cooking and dining experience. Chef John has created an amazing menu for our dinner, weaving Dry Creek Peaches throughout the entire savory and sweet four-course menu. This evening’s dinner will feature neighbor Preston Vineyard wines.